I love apple crumble especially in winter ! It is my go to dessert when I have people over or just for the family. This time, I tried to make it healthy by adding walnuts and using rolled oats instead of only flour. Walnuts add a nice dimension to this classic dessert. It tastes heavenly with a dollop of vanilla ice cream on the top. Preheat oven to 180 degrees. In a bowl combine the flour, sugar, oats, cinnamon and butter. Use your fingertips to add mix the butter into the flour mixture till it becomes crumbly. Throw in the chopped walnuts. In an ovenproof dish, add the cubed apples. Toss the apples with lemon juice, a tablespoon of sugar and a tablespoon of the flour mixture. Spread the walnut flour mixture evenly over the apples and dot with butter on top. 5. Bake for about 25-30 minutes till golden brown. 6. Serve hot with vanilla ice cream. Enjoy! Summers are here early and in full swing! Mangoes are also available in the market now! Its the time of the year to make cool and refreshing ice cream. Take a look at my easy and lip smacking 4 ingredient mango ice cream made without an ice cream maker. You will surely want to try it out! 1. Take the diced mango, milk, condensed milk and cream in a blender and churn it well into a smooth mixture. 2. Pour into the tray/jar in which you want to set the ice cream. I used jars. 3. Keep with the lids on in the freezer for at least 8 hours. 4. Garnish with chopped pistas. Enjoy delicious and cool ice cream! This easy 4 ingredient chocolate log is loved by both kids and adults alike! Over the years, this is the one thing my children have always asked me to make whenever they come home….whether they are 15 or 30! This quick recipe requires no prep and is very simple to make. Take the Marie biscuits and throw into a blender. 2. Add the condensed milk and the cocoa powder and blend till a lump has formed. 3, Remove the lump from the blender. Add the walnuts and mix well. 4, Roll out some foil and sprinkle it with grated coconut or powdered sugar. Form the lump in the shape of a log and roll it along with the foil. 5. Freeze the log for a few hours and then cut into chocolate rounds! Enjoy! This classic cake has always been a favorite of mine! I had been craving something sweet and this buttery rich cake with caramelized pineapple was just what I wanted. Luckily I had a tin of pineapple in my pantry along with all the other ingredients, so I could rustle up this super moist and flavorful dessert. I invited a couple of friends over for coffee and cake ….the cake is a total show stopper besides being lip smacking good!! Grease the base of a 7 inch round cake tin well and line it with greased paper. 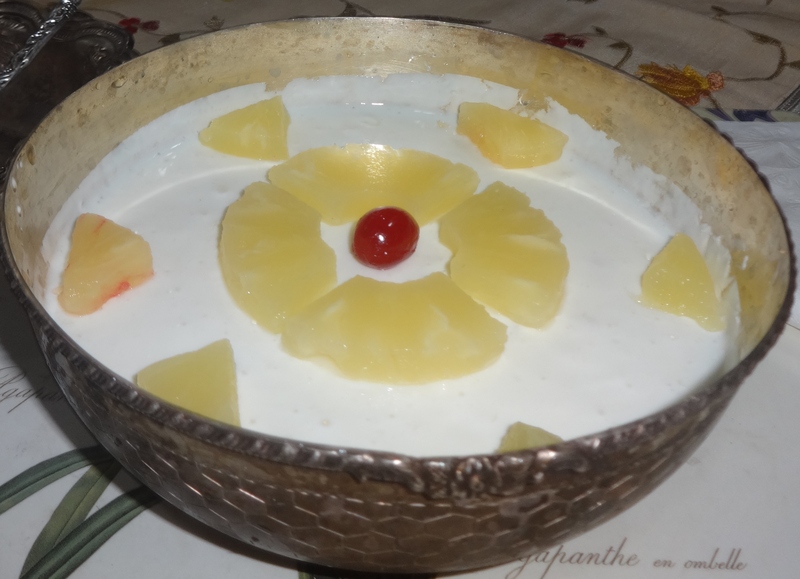 Arrange pineapple slices and cherries decoratively in it and cover them with golden syrup. For the cake: In a bowl, add the butter and castor sugar and mix well. Whisk in the eggs and stir well. Now add the flour slowly 1 tablespoon at a time, mixing well. Now spread the cake batter evenly and carefully over the pineapple slices. Bake in a moderate oven at 180 degrees centigrade for 45 minutes till cake is done. Invert cake on top of a cake stand or a large serving plate. Slice and serve warm, room temperature, or even cold. Try serving with vanilla ice cream – it’s a delicious combination. 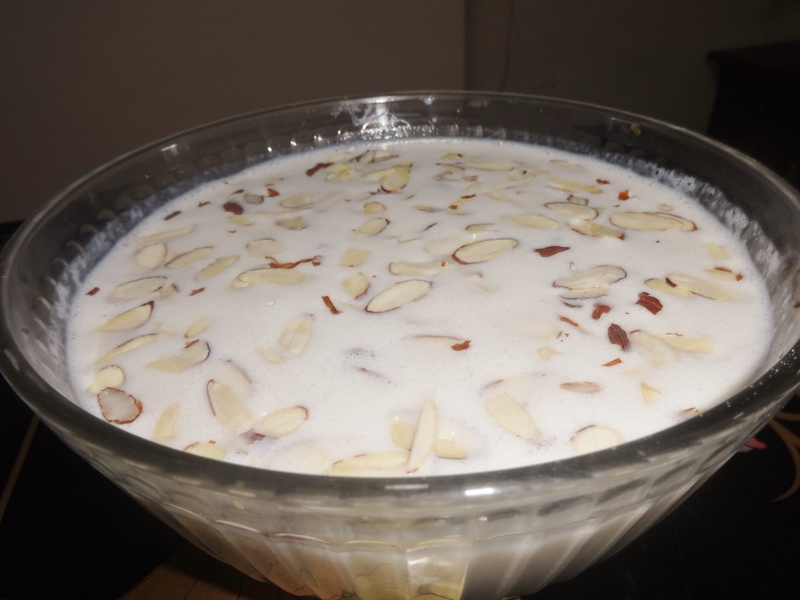 This is my version of the classic Phirni which is made with rice. I use bread instead and it comes out as delicious and creamy as the original. 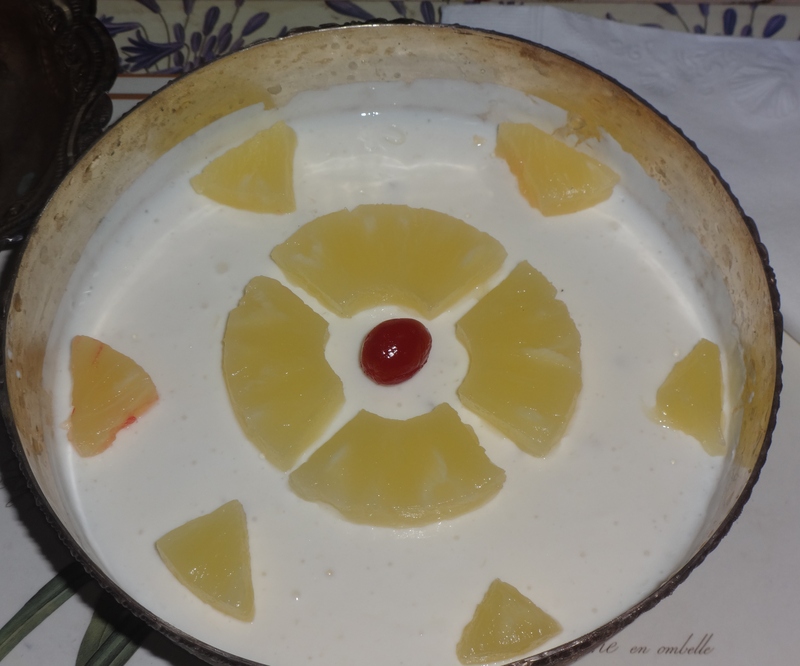 Bread Phirni is an easy dessert which appeals to the taste buds. This is the sweet to make when you want to impress your guests! 1. Heat the milk in a thick bottomed pan. Reduce the heat when it starts boiling. 2. Cut the bread slices roughly into 4-5 small pieces. 3. Powder the cardamoms and add to the milk. Add the sugar and keep stirring the milk. 4. Add the bread slices to the milk and mix well. Keep on low heat and cook for 10-15 mins till milk thickens. 5, Now remove the pan from fire and allow to cool. 6. Put bread-milk mixture in a blender till it becomes smooth. 7. Pour the mixture into a serving bowl. 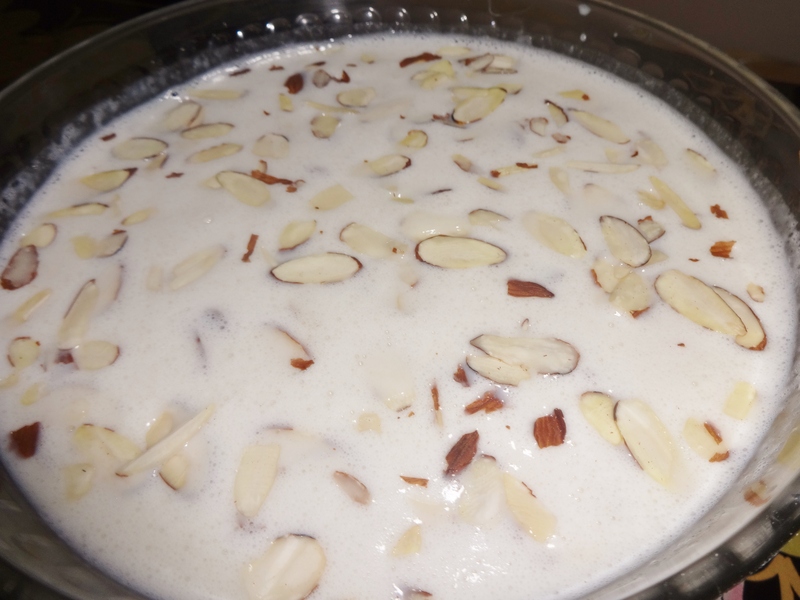 Stir half of the almonds into this mixture and garnish the Phirni with the remaining almonds. 8. Chill the pudding in the fridge.